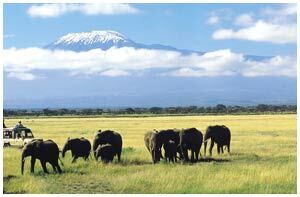 Depart Nairobi for Amboseli National Park via Namanga border town for lunch. Arrive in time for an afternoon game drive. Dinner and overnight at Amboseli Sopa / Amboseli Serena / Oltukai Lodge / Tortilis Camp. Proceed for an early morning pre-breakfast game drive. Return to the lodge or camp for breakfast. drive, looking out for the peak of Kilimanjaro which can be seen in clear weather. Elephants can be seen bathing in the swamp grounds which get their water from springs fed by the melting snows of Mt. Kilimanjaro. Morning game drive enroute to Nairobi. Arrive for lunch at Carnivore / Pampa Restaurant.